Robert Slimbach was born in 1956 in Evanston, Illinois, USA. Shortly after, he arrived in South California where he spent his childhood and his youth. After leaving college he developed an interest in graphic design and typefaces while running a small screen printshop for manufacturing posters and greeting cards. This work brought him into contact with "Autologic Incorporation" in Newbury Park, CA. 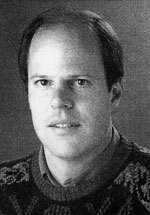 After training from 1983 to 1985, Robert Slimbach worked as a font designer with "Autologic Incorporation", where Sumner Stone also worked for a short time. There he received further training, not just as a font designer but also as a calligrapher. Robert Slimbach was then self-employed for two years and developed the two fonts "ITC Slimbach®" and "ITC Giovanni®" for the International Typeface Corporation in New York. In 1987 he joined "Adobe Systems". Ever since, he has been involved in developing new fonts for the Adobe Originals program. His time at "Adobe Systems Incorporation" in Mountain View, CA, has seen the production of the Utopia®, Adobe Garamond™ and Minion­® font families by 1991 and Poetica™ by 1992. Myriad is a registered trademark of Adobe Systems Incorporated which may be registered in certain jurisdictions.